Here I present two excellent summaries of crop circle research which has been recently carried out by investigators Jeffrey Wilson, Delsey Wilson, and other members of ICCRA, the Independent Crop Circle Research Association. I congratulate these individuals for another job well done, and I extend my gratitude to them for taking the time out of their lives to engage in this important research effort. The results of their investigation of the Crop Circle which was recently discovered near Chillicothe, Ohio, have now been published, and their findings are quite remarkable. Through research which has been carried out by ICCRA and BLT Research, Inc, it is being made increasingly apparent that some crop circles are not produced by human beings. Below I will turn your attention through a link to an excellent summary of ICCRA’s research of the Chillicothe formation which can be found at Linda Moulton Howe’s website, www.Earthfiles.com. Be sure to listen to Linda’s MP3 recorded interview with investigator Jeffrey Wilson, Director of ICCRA. Of special interest is the failure of Jeffrey’s iPhone digital compass, as well as other, conventional magnetic compasses, when ICCRA investigators were inside the boundaries of the Chillicothe Crop Circle formation. Similar anomalous magnetic interference has been described within the confines of non-manmade (Genuine) Crop Circles in the U.K. on many previous occasions. Please click HERE and HERE to read Linda’s reports parts I and II, and HERE to go to Jeffrey Wilson’s report on the ICCRA website at www.ICCRA.org/. 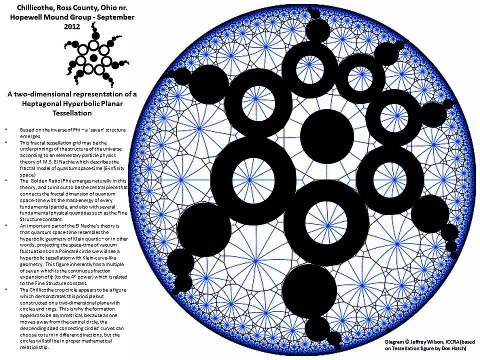 Jeffrey Wilson believes that the Chillicothe crop circle may be intended as a two-dimensional representation of portions of a heptagonal hyperbolic tessellation. For those of you, like myself, who are unfamiliar with this term, shown below is an example of such a mosaic design, which I believe could also be considered as a form of a fractal, presented with a diagram borrowed from the ICCRA website. Do you agree with Jeffrey’s conclusion? (Tessellation: a covering of an infinite geometric plane without gaps or overlaps by congruent plane figures of one type or a few types; a MOSAIC). I am a 43 year old Mother of 1 son, Om Siddhartha Gotama Archer, I received blueprint information from 1986-1996…as to these symbols and my first internet identity/email was 1atomicbutterfly..dot, blah blah, because of a transmission that was especially powerful and has remained my pathwork to encode&unfold,create&express,and the only words I knew to describe to my peers were that of a ‘butterfly’. However the butterfly was a heptagonal hyperbolic tessellation….sacred geometry…sacred communication, using light sound and universal symbols…I breathed a sigh of relief when I saw the message I have been waiting for half my life…thank you for your work and perseverance…I am a graduate of The Nizhoni School For Global Consciousness…divinity arts program, under the teachings of Chris Griscom and The light Institute, in Galisteo, New Mexico…I now live in Bend, Oregon but I found out I was pregnant with my son while in Athens Ohio in summer on 1996. I had randomely went to Ohio to study as a researcher for Signature Sound Works and was only ever in Ohio for the first months of my pregnancy…this particular crop circle holds the clues to how we are actually designed…. Interpretation of crop circle images and what they might mean is sometimes fairly obvious and sometimes quite puzzling. Some might be interpreted as referring to virus, some (possibly) to bacteria, and some (definitely) to insects. It seems as though you are interested in those which may be referring to bacteria. Please tell me which of these are you specifically interested in, and I will try to point you in that direction. Are there any crop circles in Ohio or Kentucky that are stil intact and which can be entered, without tresspassing? Hi, I noticed your comment in June on the cropcirclesfoundation.org site, and wondered if you found any in the ohio or nearby states? I am an English woman living in Indianapolis and interested in visiting these areas. Great work, folks! We are neighbors and compadres. We researched the Gray TN circle last month, and did some work with the new formation in Turin Italy. We look forward to visiting Serpent Mound July 11.